inside the box: November 2017 — myblackbox co.
November is a time of reflection for everything you are thankful for. Although we are thankful daily, we want to take a moment to say THANK YOU for supporting us since we launched earlier this year. 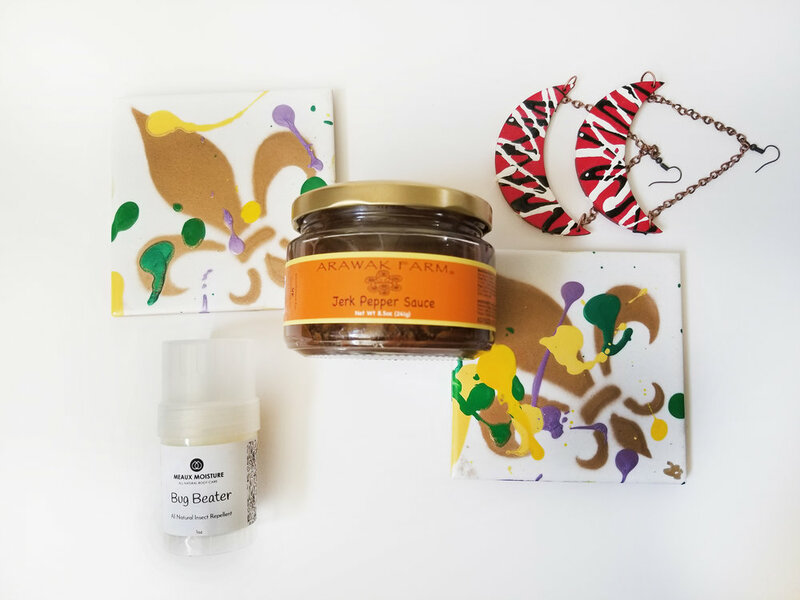 This month we featured four Black-owned businesses from the following categories: bath & body, food & drink, fashion accessories and home & office. As always, make sure to share your unboxing photos and videos by tagging #myNOVEMBERblackbox. We love sharing what you've discovered. Arawak Farm - Jerk Pepper Sauce: November is the time to throw down in the kitchen, so we decided to throw some heat in too. The Jerk Pepper Sauce from Arawak Farm was a great find for this time of year. The collection of spices, rubs, sauces and spreads are inspired by and pay homage to founder Lloyd's Arawak Indian heritage. The Jerk Pepper Sauce has some kick, but it's too good to stop eating! Meaux Moisture - Bug Beater Insect Repellent: We wanted to feature a unique bath & body product in November's box and loved the idea of a natural insect repellent that we discovered by Meaux Moisture. This is a handy item to keep in your purse or handbag after we make it through winter season. Owner Morrisa, has a nice variety of products in her line including face, body, hair and men's. Rochon Ink - Carnival Gold Coasters: When we discovered Ursula's work and her line Rochon Ink, we fell in love. Her artwork is vibrant, colorful, and screams New Orleans! The Carnival Gold coasters were a perfect fit for the box and we love her hand-painted design. Rochon Ink provides art prints, magnets, street tile paintings and coasters. Root & Hope: Half Moon Earrings: The Afro-Caribbean inspired collection by Root & Hope, owned by Ruthann, was such a fun discovery. It was tough to choose which item from her collection to feature in November's box. She makes a variety of bracelets, earrings and chokers. You'll find natural wood used in her work and can definitely see the craftsmanship in the finishing touches. We are just about done with 2017 and we are thrilled to have you on this journey of discovery with us. Don't forget to tag us with #myNOVEMBERblackbox when posting photos and unboxing videos of your blackbox for an opportunity to be featured on our website. What was your favorite product this month? Share in the comments below! December subscriptions are open for a short period of time, closing on November 15. 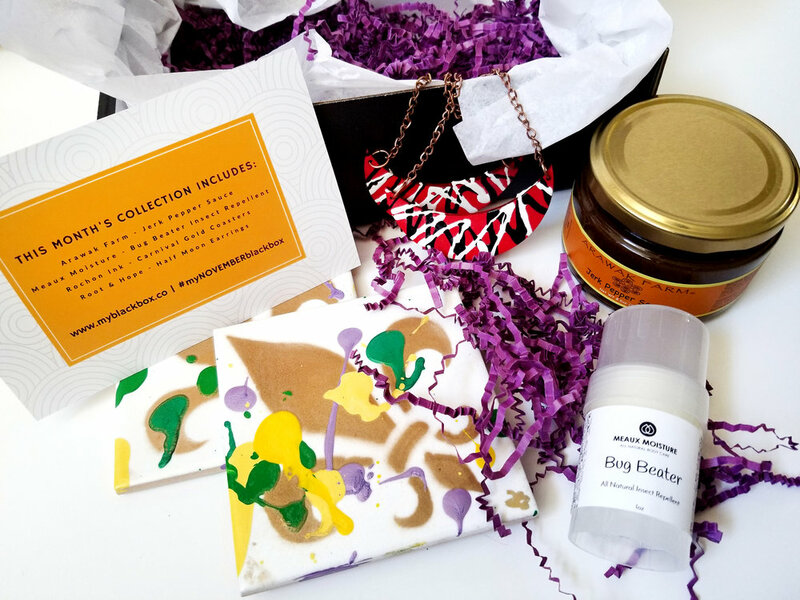 If you haven't yet subscribed, better get your December box here!